This week’s Secret Ingredient for Friday Foodie Fix are peaches! There is nothing like biting into a really fresh ripe and juicy peach. But there are so many more ways to use peaches. They taste great as a dessert but you can also use them in savory dishes with chicken and a nice white fish. As I was writing this I realized I have not cooked with peaches in a long time. Well that is going to have to change. But I need some ideas. Peach So please share your recipes using peaches here with Mr. Linky. If your recipe is not ready, you can come back anytime and add in the link. I will be highlighting all of the summer Friday Foodie Fix recipes at the end of the season. 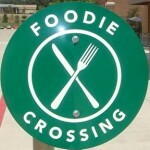 To find all of the past Secret Ingredients, visit the Friday Foodie Fix homepage. Next week’s Secret Ingredient is …………. Arugula! Oh yay, it is the heart of peach season right now!!! I'm sharing a super simple recipe that we make a lot when out "camping" (and by camping in this sense I mean staying in a cabin with access to a gas stove & oven…) in New England! I made Peach Macadamia Scones – yum! I made a Peach Avocado Salsa to go with Pork Tenderloin and a Fig Balsamic Reduction Sauce! I was just planning on posting the Old Fashioned Peach Cake but then I remembered tonight's dessert of Wild Blueberries and Peaches over Shortcake shells with all kinds of toppings. Can't wait to get some more peaches to try some of these!